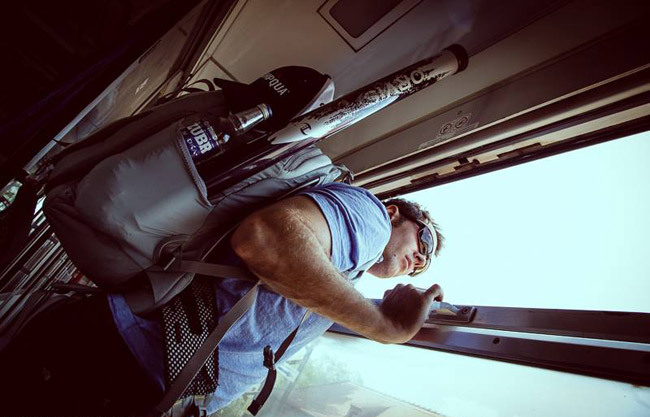 So much of our traveling is about where we go and what we catch, but over the last few years I’ve been thinking a lot about the way we move through space. Sometimes our schedules dictate our locomotion, sometimes our own bodies, other times the landscape itself. This photo essay explores the following question: How does the way we arrive at and move through our destination change our experience of the trip? Bushwhacking on foot through tough country reveals a certain contradiction. It’s at once the most fraught way to get around (it doesn’t take much to sprain an ankle), but there’s also a sense of comfort that comes with knowing exactly how you got to where you are and exactly how you’re getting back. Here, U.P. 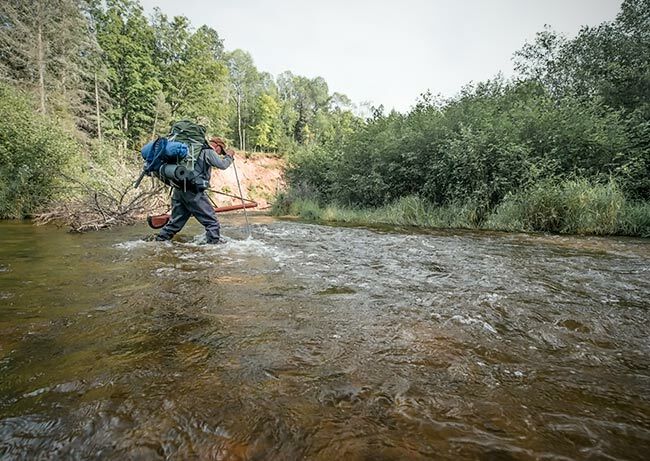 guide Randy Berndt navigates a slippery river crossing of a Lake Superior-bound freestoner. 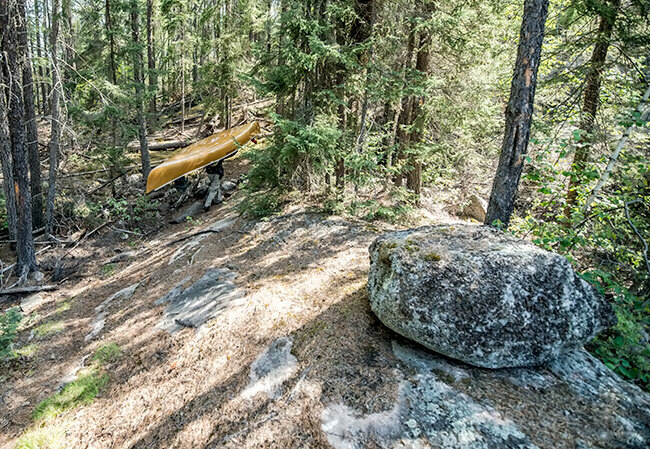 Few modes of transport as a liberating as a canoe. The fact that this ancient way of travel is also the most liberating makes me admire our human ancestors that much more. On canoe trips I feel the most natural. Civilization peels away, and by the last day of a ten-day loop, whatever cultural boundaries existed before are largely dissolved. This manifests in my fishing, where I’ll look down at what am doing and ask, “Is this even fly fishing any more?” Then I laugh. The boreal forest couldn’t care less. 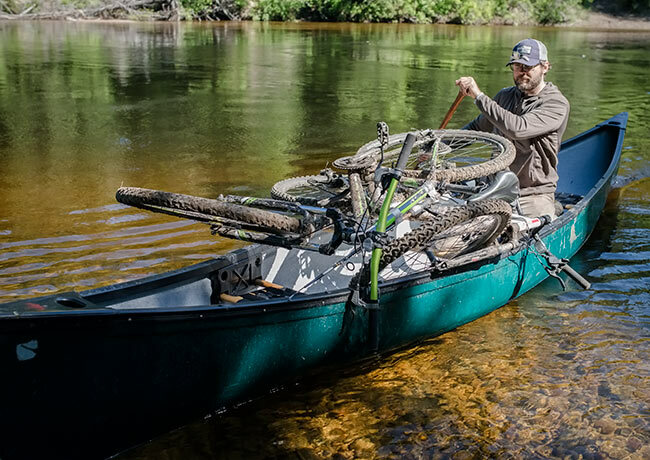 Above, Jeff Karczynski portages his way across Woodland Caribou Provincial Park. 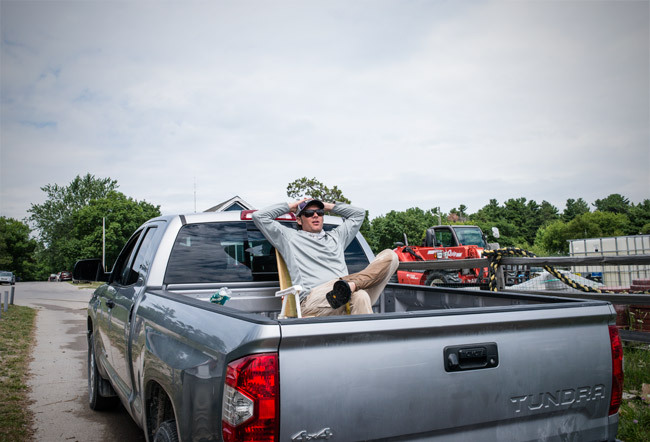 In Michigan, we shuttle our cars by river roads and two tracks, the river we’re about to fish obscured by walls of white pine In Patagonia, where there are no river roads, the boat must serve the dual role of fishing vessel and shuttle. Which means we start each day by motoring miles upstream. It’s an hour-long slow draw of anticipation’s arrow, and it’s almost too much to handle. 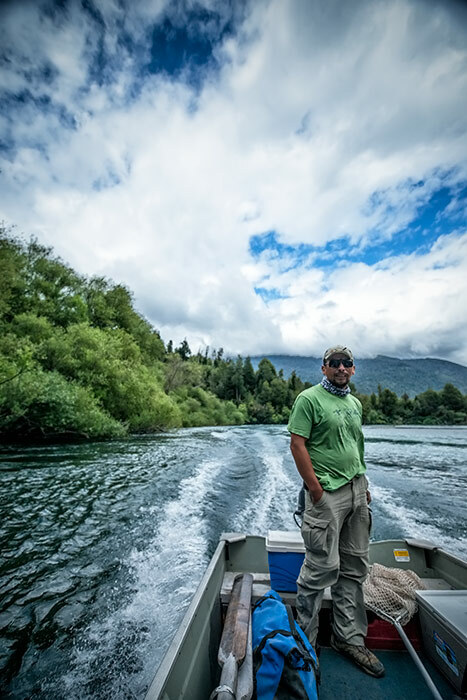 Here, head guide Adrian Suazo of Yelcho en la Patgonia steers his rig up the brawling blue water of the Futaleufu. There’s something absurd and beautiful about insanely long road trips, particularly insanely long road trips that end in six-pound brook trout. 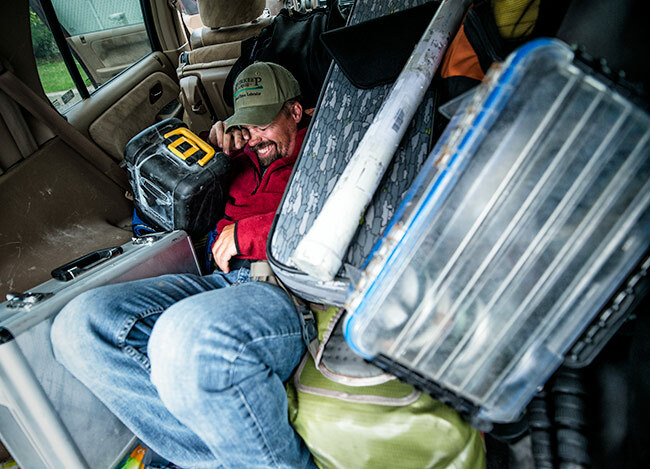 The look on Jason Tucker’s face clarifies that he know’s exactly what he’s doing in choosing the open road over the open skies as he travels between Atlanta, Georgia, and Labrador City, Labrador. A rafting trip is a one-way street if ever there was one. 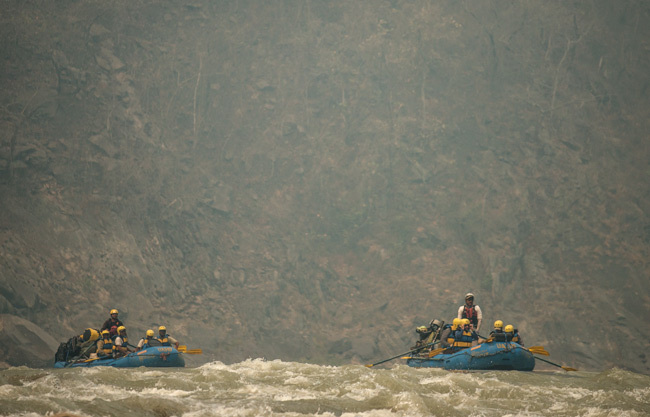 Few things feel as inevitable as a raft coursing it’s way through a Himalayan canyon. If you had time to think between the furious paddling you might find an odd comfort in the idea that, survive the journey or not, you’re only going on way: downstream. Of all the ways I’ve traveled, no mode has put me in such direct contact with the power of the natural world. Here, guide and outfitter Misty Dhillon scouts a rapids on the legendary Mahakali River. 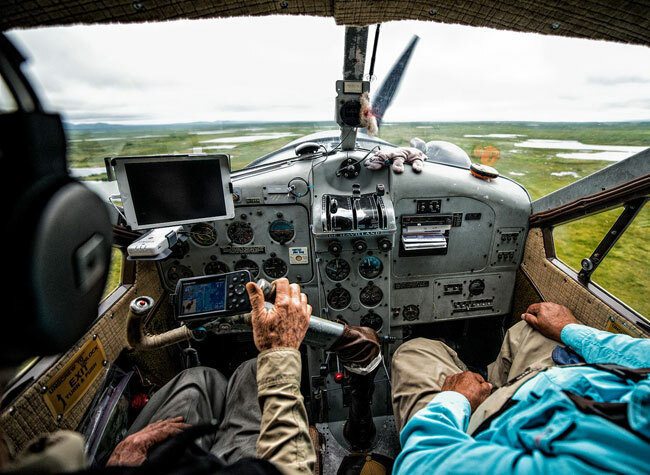 If the raft is a place of little thought and constant work, an hour-long flight in a float plane is a place of deep thought and total leisure. The pleasant passivity of flying drives you deeper into yourself, into a waking dream partly if not wholly authored by the landscapes below. The above daydream came compliments of Alaska’s Bristol Bay watershed. And then there are modes of transport you didn’t know existed until you got there. Those who’ve been to Michigan’s Beaver Island know: the only respectable way to get to and from your boat launch is to boodle.